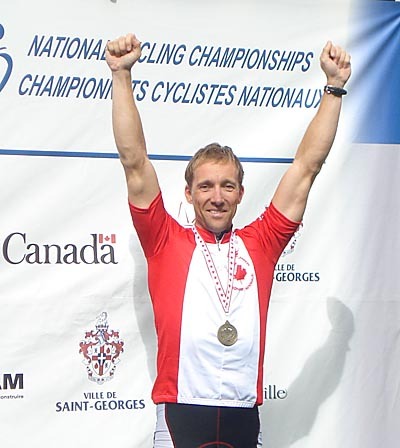 Our occasional correspondent Amy Smolens, suggested doing an interview with the 2009 Canadian Men's 40-49 Road Champion - Daniel Martin. While we usually focus on the established pros, or the up-and-comers, it's important to recognize that cycling encompasses an enormous range of athletes, across multiple disciplines, and that each has a story to tell about our sport. 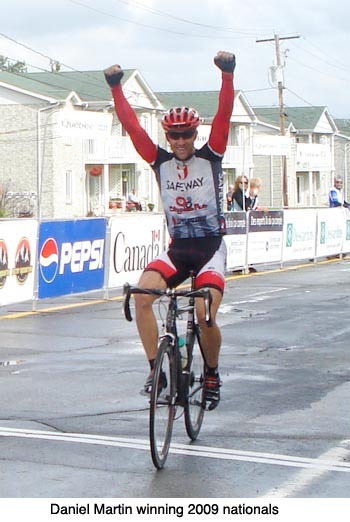 When my friend and colleague, Gregg Betonte, told me that his Safeway/Bicycle Plus teammate, Daniel Martin, won the Canadian Masters 40-49 National Championship, I was impressed. When he told me that Daniel was a former Olympic-caliber rower, I thought it was a great story. When he mentioned that he lived in the Bay Area, I knew I was in luck. My luck got even better when I discovered that he would be competing in the Albany Criterium, an annual race that takes place eight blocks from my house. I rode over to the race and checked in with Daniel as he was warming up for the short, hard effort. Aggressive as usual, on the second lap of the crit he bridged to a solo rider, and drove the break for the remainder of the race. He later explained to me that he had stayed out front to make sure I got plenty of photo ops. Well done, Daniel! After his second-place finish, I had lunch and a nice chat with one of Canada's newest champions. Amy Smolens: You grew up in St. John's, Newfoundland - I'd expect to see you playing for the Sharks. Did you start off playing hockey? Daniel Martin: Yeah, I did. My dad was a big hockey fan so I think I learned how to skate before I knew how to walk. Up until senior high school, hockey was the sport and then you have a choice to make, whether you're good enough to go to the Juniors or not. Maybe if I'd had good training discipline I would have been good enough, but I wasn't. I think you've either got to have really, really good parental support and they force you to train, or when you're 16-17 you don't have the discipline that you have at 30. I look back and think, “why wasn't I training? I just played games, that was it!” So that was it! AS: The most famous Newfie in this area is Ryane Clowe, who does play for the Sharks. Do you know him? DM: Ryane Clowe? Yeah, I know him but have never met him. AS: The Sharks just re-signed him to a four-year contract for $3.5 million U.S. so you're probably not the highest paid Newfie around...but working for Cisco, you've got something in common, right? DM: (Laughs) Yeah, yeah, not really. I kind of wish ... I came into Cisco a little later. Two years earlier would have been great, then we'd have something in common. I came in just before the Dotcom Bust so I went through the roller-coaster. It looked good at one point, in 1999-2000, but then it all collapsed. AS: So is working for Cisco how you ended up in Northern California? DM: Pretty much, yeah. I got my Electrical Engineering degree at Memorial, which is the big university in St. John's, moved to Ottawa, central Canada for five years, working at Nortel Networks and then moved to Cisco after that. My manager and a couple other workers left and went to Cisco and after six months of twisting my arm got me here. It was a combination of better career choice and full-time summer, right? I wasn't used to that so it was a good change. AS: How did rowing get into the picture for you as a competitive sport and how far did you progress there? DM: I told someone this the other day and when you think about it, it starts making sense. I grew up not middle-class, basically not well-to-do, grew up with my mom, my parents had separated and divorced. I remember when I was 14-15, I said, well I need to get a degree to get out of here, because the economy was really bad in St. John's, or sport will get me out of here. So I took a two-pronged approach. I went through hockey, and then after hockey I ran cross-country and then I found rowing. And I was pretty good at rowing because I was a little heavier built than the runners, from hockey, we did a lot of weight-room stuff, and I just picked rowing and said, “ok, this will take me to the National Team.” So as I was doing my degree I just kept rowing, so that was my two-pronged approach and in the end both of them got me out of there. AS: What were some of your greatest accomplishments in competitive rowing? DM: It was kind of weird, in rowing it's such a team sport that you need to go to the camps. My problem was that I didn't go to the camps, I would be working fulltime and I'd train myself and then I'd go to the Trials (for the Olympics and World Championships) and because I wasn't a camp rower I had to win the Trials or if it were a four-man boat, I had to break into the top four. If I was fifth I would be the cut-line, right? So the first couple years I actually was the cut-line. I got fifth when they were making a four, I got third when they were making a double. And after like the fourth year of being the cut-line I remember blowing up at the coach - “I'm the cut-line, knock it off! Why don't you just go one underneath me? !” Then the next year I came back and I made the squad, raced as a Canadian double, never went to the World Championships but raced all across North America representing Canada, that was like 1997. 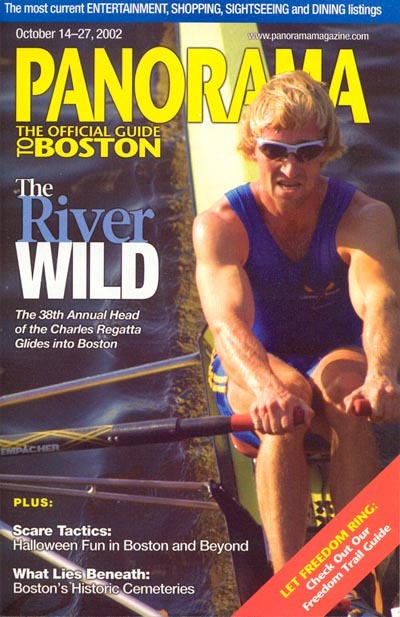 I moved down here in 1997, kind of went through a bit of a hiccup, got back into training, and went up for the 2000 Olympic Trials for the two-man boat, so I made the selection. Unfortunately, we didn't pre-qualify the year before so we didn't actually get to go to the Olympics. I didn't go up in 1999 so I wasn't part of the (pre-qualification process.) It's based on the 1999 Worlds, whether you qualified so I wasn't part of the push to get the boat qualified. So I did what I could in 2000 and made the squad, but unfortunately it didn't work out. AS: And then you had another close call - you were the last man out for the Quad for Athens in 2004. DM: Yeah, last man out in '04, pretty much. That was kind of at the international level, what I was trying to do. But during that whole process whenever I didn't make the team I would just do the whole domestic scene. So I won the Canadian Nationals in the single and the double in 2002 and then I teamed up with a guy in San Francisco and we won the U.S. Nationals. There's a club Nationals, which is if you're a resident of the U.S you can compete, so that's the one we won. Then there's the real U.S. Nationals where you have to be a citizen. So I got some national titles, and second twice at the Head of the Charles in the single, so overall most of my results were domestic. I never actually went international, but I was close a couple times. AS: How and why did you make the transition into cycling? DM: After 2000 I took two years off (from rowing,) so 2001-2002 I biked and got up to a Cat 2, then went back for 2004 to rowing. Then after 2004 I was racing bikes in 2005 and that's when Robert Pasco, the guy who was thinking about putting Team Safeway together, got to know me and recruited me for the Safeway team so that was four years ago. AS: What do you transfer from rowing to cycling that helped you and when did you begin to experience some success? DM: Well, rowing is a tough sport, it's a masochistic sport, so it blends into cycling. One thing you don't realize in cycling because there's such a chess game out there and you have the draft advantage, I think people as they're developing in cycling don't realize that you need to commit at some point, you need to throw yourself out into the wind and just go for it for five minutes or ten minutes or a twenty minute climb. There are a lot of card games that go on in cycling, and you get someone, and I've had a couple of other teammates who have switched over from rowing, and because every workout you do is just a painfest, you actually do pretty good right away! It depends on the terrain, if it's a tough course, you have no problem pulling a pack up a climb. I see a lot of the newbies in the sport that don't come from a sport similar to rowing that don't have that masochistic view of “full-on suffer.” Say you have a ten-minute climb, the damage doesn't happen in the first two minutes, the four minute point or the six minute point - but at the eight minute point, you can split the pack and you can get groups going. So I think that's ingrained in me. Very rarely will you see me sitting in the pack for the whole race, at some point I'll just go for it! So yeah, I went up through the categories pretty quickly. The first Pro/1/2 race I ever did was San Dimas, where I got 9th overall in Pro/1/2 and I was a brand new Cat 2, which was a pretty good result, a lot of top guys were there. And I went off in an early break and I just went as hard as I could for four hours. AS: Ok, now let's talk about the National Championships in July. You had no teammates in the field so what was your plan going into the race and how did the race develop? DM: Just do what I do, which is just make it hard. When you have no teammates you have two options. One is to really sit back and try to be crafty and be in the right moves, or just make the race, and I did the latter, I attacked right from the line. Basically, a lot of the guys know me so they know I'm someone to watch out for in the race, so instead of trying to be buried and be quiet I decided that I don't want people looking at me wondering when I'm going to bridge across to the break, I want to be the break. So I was off solo for the first lap and a half (of four.) I might not have gone solo if it wasn't bad conditions, but it started raining and was really windy, so it favours a break, so I was hoping to draw some guys that were obviously watching me and I did. So we ended up with a break of three, and then I went solo again. Then I got caught and there were some counter-moves right away and rather than trying to be buried in the pack, I was really alert again and I went across again to the break at a hard point, a break of six, and we went away. You either make sure you're in every move and you might end up falling down at the end and not getting your result, but at least you're giving it a shot. And I spent a lot of time training pretty hard to make sure that I didn't fall down at the end. AS: That's pretty impressive to win a race like that going against powerful teams like Wheels of Bloor and Ride With Rendall. AS: Well, you got your revenge this year. DM: Yeah, I got my revenge. It was sweet revenge because it was a similar race, similar style and I had a little bit better legs this time so it wasn't a two-person approach to the finish, it was just one. AS: How nice was it to win in front of your family, who'd made the trip to Quebec? DM: My sister just bought a house in Toronto so I arranged that we all went up to help her move in so it was my brother, my dad and a really good friend of mine. We actually built a patio in the back and a deck the first week, so that was my pre-race training (laughs.) Yeah, that was great, it was great. My dad really hasn't watched me race. He watched me once before and I crashed out! Looking at my dad, the thing that was most pleasing was just to see him at the end and him realizing that, hey, I am a legitimate cyclist, because up to that point he hears that I win stuff but never sees it and I'm sure he questions my sanity sometimes. AS: How does it feel to wear the Maple Leaf Jersey in races with Team Safeway/Bicycle Plus and show it off in races? DM: Oh, it's empowering, it's really good. I mean cycling's a small community everywhere, but here in Northern California it's really small and as much as we bang heads out there in the races, compete against each other and badmouth each other when things are a little bit shaky or shady, we're all brothers and we're all good friends, so I get a lot of congratulations from people, just as if I see someone win their country's jersey I congratulate them, too. It's good, especially in the Masters' circuit. The pro circuit there's a lot of sacrifice on the line so there's camaraderie but not as much as in the Masters, everybody's got kids and families and jobs and we're all so similar, we know so much about each other and we're all addicted to the sport, we know our sickness! AS: After missing out on the Olympic stage in rowing, talk about the pride you feel now from wearing your National Championship jersey. DM: It's great, I mean, I love Canada. I don't think it's the country that defines people, it's the people, and I love the people up there, especially East Coast, where I came from. They're not as well off as California in a lot of senses but they're better off in some senses, it's a really tight-knit community and I wear it with that in mind. There are a lot of people who know I've been going for it the last couple years. It definitely empowers me. I've been wearing it sometimes on training rides and I feel like I'm representing something now, which is empowering. AS: Now that you're National Champion, what other goals do you have? DM: This year I've been making a big push and goal number one was the Canadian jersey. I was hoping to go to the Austrian (Masters) Worlds, but what happened is that my really good friend who's getting married in Kenya moved his wedding from August 1st to August 15th so that collides with the Worlds. So maybe next year, but that's a whole different race. A lot of these Masters races, wherever the race is that's where you get the majority of teams and contestants. So when the Masters Nationals in Canada are in Quebec you get 50% of the field from Quebec, so in Austria you get 50% of it from Austria and Germany, which is a lot of good Masters riders, so it's definitely hard. Hopefully I'll put it on my calendar next year. But I'm just having fun right now, we have a good team. AS: You still have nine more years in this Masters category to win the same jersey, right? DM: (Laughs) You know, it's harder. After you win once, I'm sure it's harder. I don't have any naïve doubt about that. They just announced that it's in Edmonton next year so I'd definitely like to go there. I remember this year when they called up the defending champ I took a good look and made sure I knew who he was, so it's definitely harder when everyone knows you won the previous year. AS: I'm not going to give away your email address publicly, but it has a rowing origin. Do you still hop in a racing shell every so often? AS: You're not home much - do you have any messages to pass on to your friends and family in Newfoundland and Ontario, since I'm sure they'll read this? DM: Yeah! You know they're definitely a big factor in my life. A lot of times when you get deep into a race and you're trying to push your body harder than it wants to be pushed it comes down to the first 20 years of your life, just what you're made of, and that came from home, definitely. A lot of people played a part in my upbringing and it's definitely appreciated and I had a lot of good role models. And now Daniel Martin, proudly wearing his Maple Leaf Jersey, can be a role model for youngsters in both California and Canada. Do you know a Canadian cyclist that has a story to share? Let us know!